Can you Believe that it’s 2015? Where has the time gone? In honor of a new year, we wanted to take a moment and thank each and every one of you who has made our year so fantastic. We couldn’t survive without our wonderful customers, and we appreciate each and every one of you! 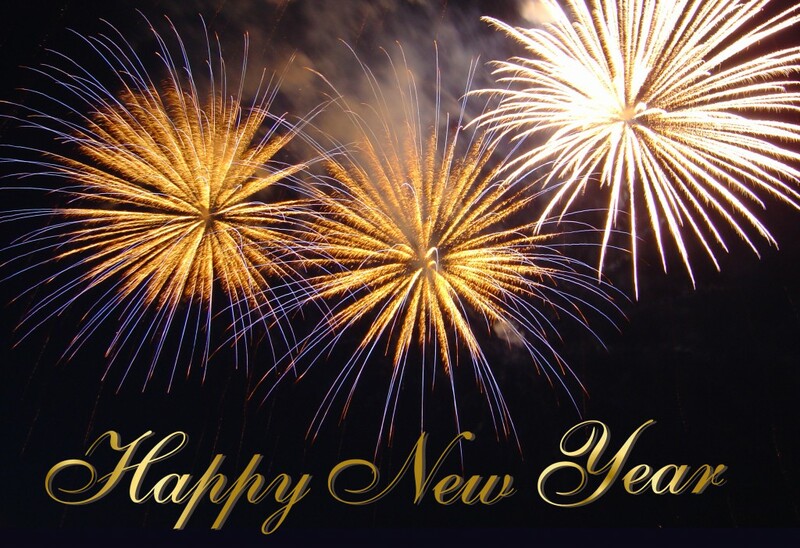 As a small token of our appreciation, please enter “NewYear2015” for 20% off all Acacia wood purchases on January 1*! We hope that each and every one of you has a safe, happy and healthy New Year. Keep checking back in 2015 for exciting new products, fabulous offers, great recipes and more. Most importantly, make sure to take time in the coming year and “enjoy the simple pleasures of life!” It’s more than our motto – it’s a reminder to do something enjoyable each and every day. Let us know in the comments – What’s your new year’s resolution? What are you most looking forward to in 2015. We may like your answer enough to offer you a gift certificate! 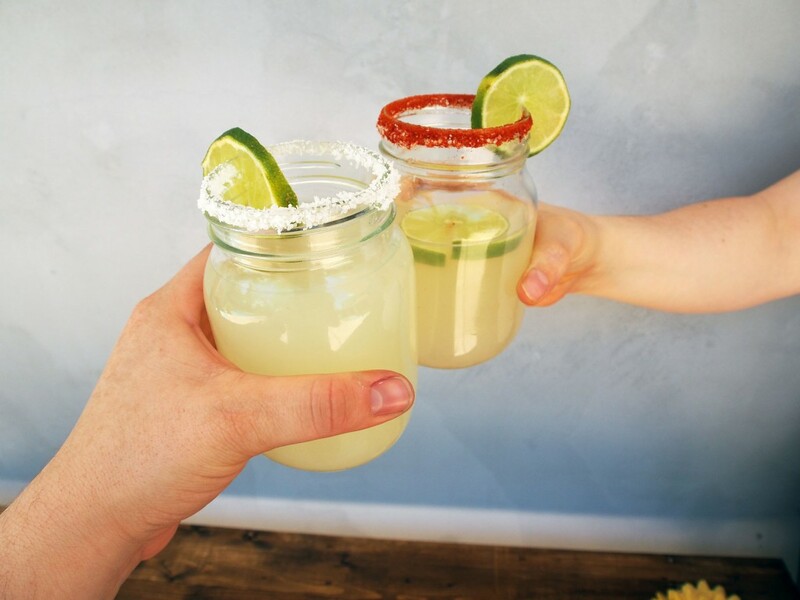 Cheers to a fantastic new year! *Coupon Valid on 1/1/2015 12:00am – 11:59pm EST and is NOT combinable with other offers or codes, including our free shipping code, newsletter discount code and blogger discount codes. Valid on retail orders only. Wholesale and Commercial accounts may not use the coupon. Happy Holidays! Here’s Our Favorite Sugar Cookie Recipe. 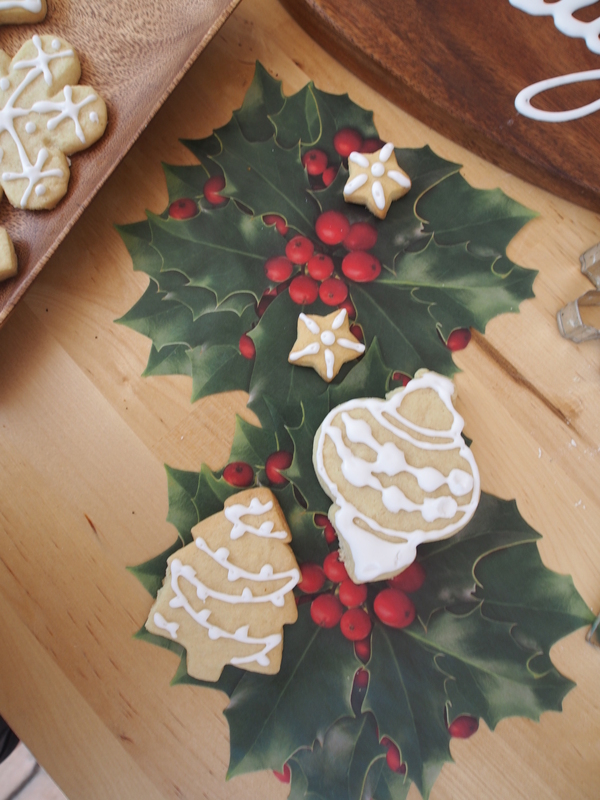 With just a week until Christmas, isn’t it time that you have a foolproof sugar cookie recipe? This recipe makes fantastic cutout sugar cookies that hold their shape and don’t need to chill first – a huge bonus if you’ve got impatient kids, or if you’re just busy. ‘Tis the season of busy, after all. 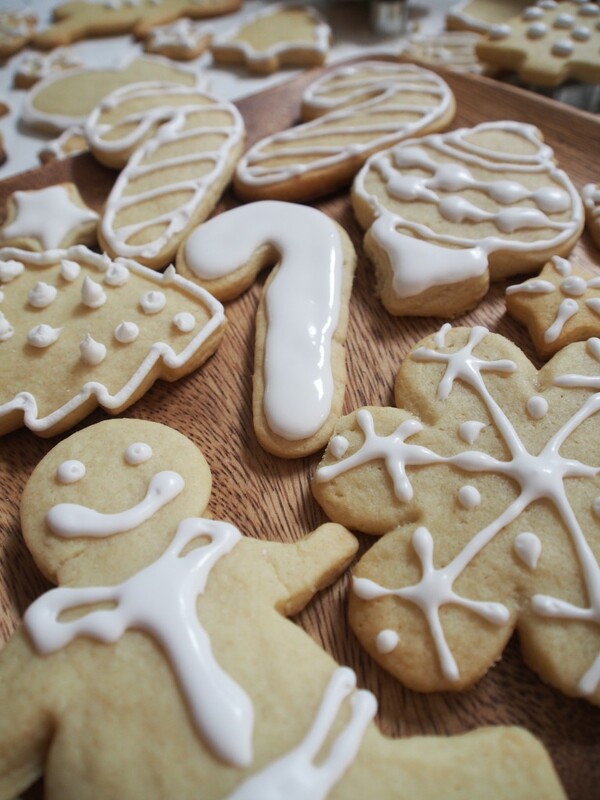 Read on for a fantastic Christmas cookie recipe that we hear Santa loves! We’re also going to link you to some of our favorite cookie baking and decorating tips from around the web. Huge bonus – even if you’ve got ZERO time to go Christmas shopping, everyone loves a box (or Kilner jar) of cookies. And these are not only super easy to make and highly delicious, but they’re inexpensive – a great way to save some money during this expensive time. Of course, if you want to buy a gift, we’ve got options, and as long as you place your order by December 23rd, there’s a way to get it to you for Christmas (Call us or Live Chat us for details – Ground shipping WILL NOT necessarily do the trick, depending on where you’re located.) Check out our Odds-and-Ends section for really cool one-off pieces up to 50% off, or take a look at our Holiday section for gifts and table decor. Or, you know, feel free to browse our entire site. We’ve got some INCREDIBLE gift ideas. Got a baker on the list? We’ve got cake stands. A holiday junkie? Consider a Mason Cash Christmas bowl. A tea drinker? Give them a beautiful new teapot! But enough talk. Let’s bake instead! What makes these cookies extra special? You don’t have to chill the dough before baking. You can freeze the cookies OR the dough. They hold their shape without being too hard. They bake quickly. But most importantly, they’re super-tasty. In a bowl, whisk together the flour, baking soda and salt until thoroughly combined. Set aside. In the bowl of a mixer (or with a hand mixer if you want) cream together the butter, lemon zest, tangerine zest and sugar until the mixture is well combined. Add the egg, scrape the bowl, and then add the vanilla extract. Add flour mixture and beat until just combined. Don’t over mix or you’ll ruin the texture, but scrape bowl to make sure everything is incorporated. Once dough is barely incorporated (It’ll still be crumbly, turn it out onto a lightly floured work surface. Knead it lightly with your hands to combine, then roll to about 1/4 inch thick. Cut into shapes and put on a parchment-lined baking sheet. Bake cookies for 10-12 minutes, until golden brown, or freeze flat with parchment between cookies. Decorate as you see fit! I use a quick royal icing (powdered sugar, lemon juice, egg white) to ice my cookies. Sometimes I go crazy with the sprinkles. See below for more cookie baking, decorating and gifting tips! Photo Credit: Bake at 350. Check it out – she’s ABSOLUTELY INCREDIBLE! 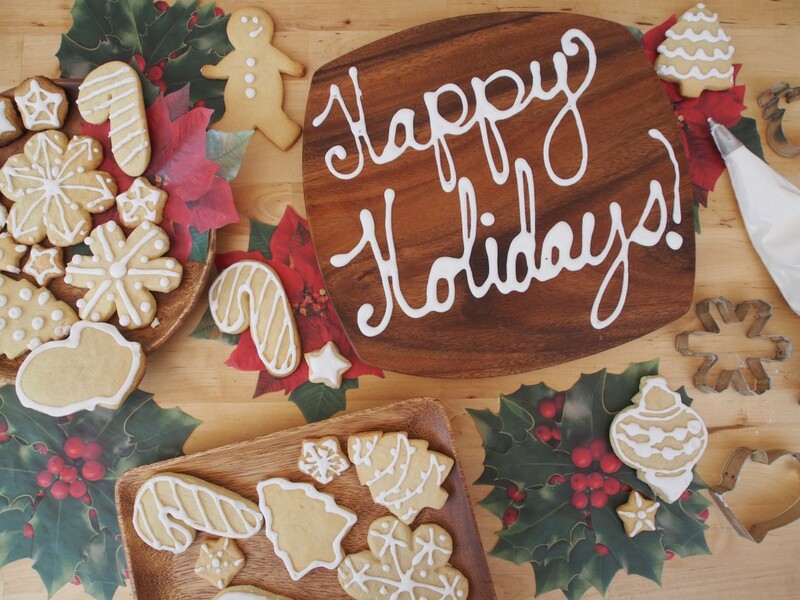 Need some cookie decorating inspiration? The Brilliant Bridget over at Bake at 350 (hello, alliteration!) has a killer holiday cooking guide – everything from recipes to tips to decorating ideas all in one place. Click here to be absolutely wowed! Photo Credit: Sweet Sugar Belle! How about some flawless icing? This post (and hello, video tutorial) over at Sweet Sugar Belle will have you making professional looking iced cookies in no time! Need a pretty cookie that packs? We are Not Martha suggests these sandwich cookies – Check them out at the end of the post, packed in cute holiday gift boxes! 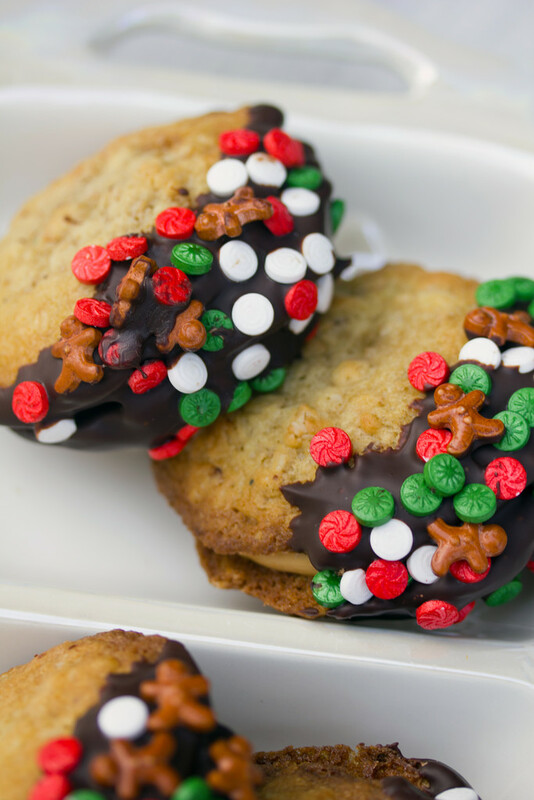 Need more cookie-wrapping inspiration? Check out this post over on The Kitchn. Everything from jars (hello, Kilner) to take out containers to brown lunch bags can be made into beautiful gift containers with a little ingenuity. So there you have it, folks. It’s not too late to make (and give) a fabulous holiday gift – I mean really, can you think of anyone who doesn’t like cookies? Whether you’re making our cookies or favorite recipes of yours, whoever is on the receiving end is going to be one lucky friend! And, since it’s a week away, Merry Christmas. If that’s not your thing, Happy Holidays, happy winter, happy day! Posted in Baking, Crafts, Do It Yourself, Entertaining, Gift Guide, holiday, Homemade, Pacific Merchants, Recipes | Comments Off on Happy Holidays! Here’s Our Favorite Sugar Cookie Recipe. Here at Pacific Merchants we love the holidays, and we’re pretty equal opportunity when it comes to celebrating. Why? Because we’re a pretty diverse group and learning about each others’ customs is a blast. 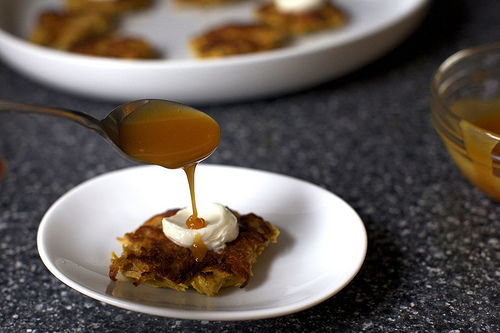 So we figured, before we dig in on Christmas-mania, early December would be a good time to share our favorite Hanukkah recipe: a simple recipe for latkes that is beyond delicious. 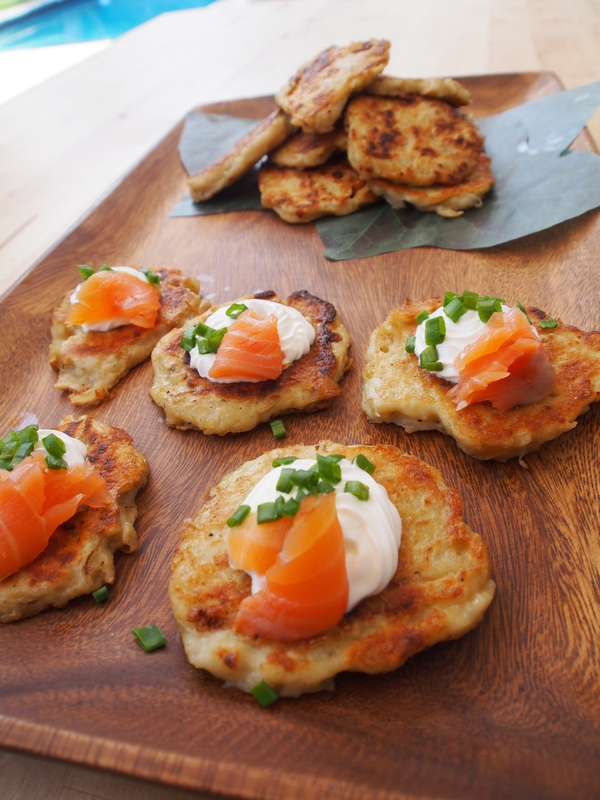 Plus, we’ve scoured the net for some other delicious variations on potato pancakes. Because nothing says good times like fried carbs, fascinating traditions, bright lights, miraculously efficient oil lamps, and great friends. I’m sure you know that latkes are traditionally served at Hanukkah, but I’ve served them at parties all year long. When made on the smaller side and topped with a bit of sour cream and a slice of smoked salmon, you’ve got a beautiful, and totally crowd-pleasing appetizer. Some other favorite toppings include: Traditional sour cream and applesauce, brie and cranberry sauce, sour cream and bacon (clearly not for those who keep kosher,) fried eggs and chives, and even peanut butter and jelly. I’ve occasionally even used hem in place of an English muffin in eggs Benedict. SO good. But suppose you want to keep it traditional and serve latkes for Hanukkah? Well, first, when is Hannukah? Unlike Christmas, it changes every year. Hanukkah 2014 is December 16-December 24. Now that you know the dates, it’s as easy as whipping up a batch of these tasty treats. Oil, chicken fat, or butter for frying. I’d suggest bacon fat, but that’s not kosher. Peel your potatoes and your onion. Either in a food processor or by hand with a box grater, grate your potatoes. If you’re using a box grater, be wary of your knuckles. I wasn’t, and I regretted it. Line a wire mesh strainer with cheesecloth or a clean dishtowel. Put all your potato and onion mixture into the dishtowel. Twist the cloth to squeeze moisture from the potato mixture, and let sit for 15 minutes to drain. 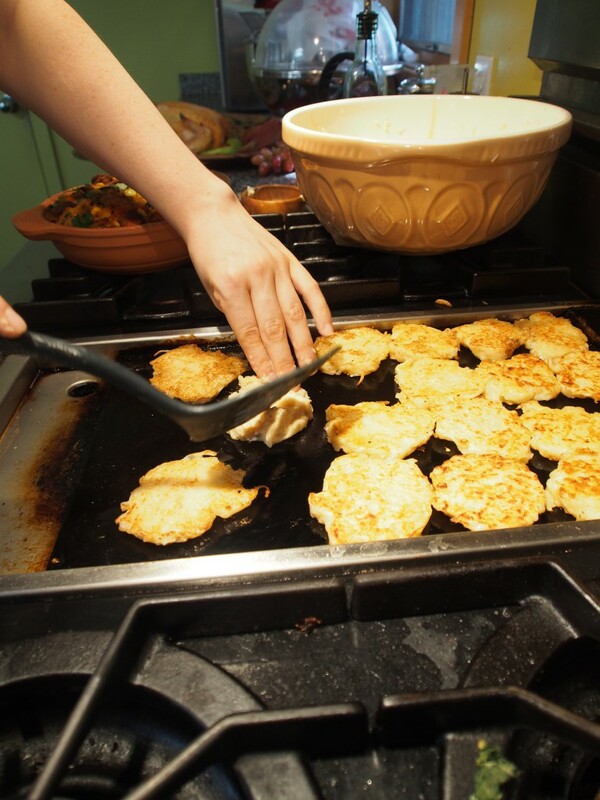 Latkes are best when eaten fresh, so about 14 mintues before you’re ready to eat, pre-heat your oven to 200 degrees, and heat a large skillet over medium high heat. Add about 1/4 inch of oil to your skillet. Drop heaping spoonfuls of the mixture into the oil. It should spread out, so leave room between latkes. Cook the potato pancakes 3-4 minutes on each side. Both sides should be golden and crisp. Eat right away or keep warm in the oven. There you have it – a delicious treat for the eight nights of Hanukkah in eight easy steps. 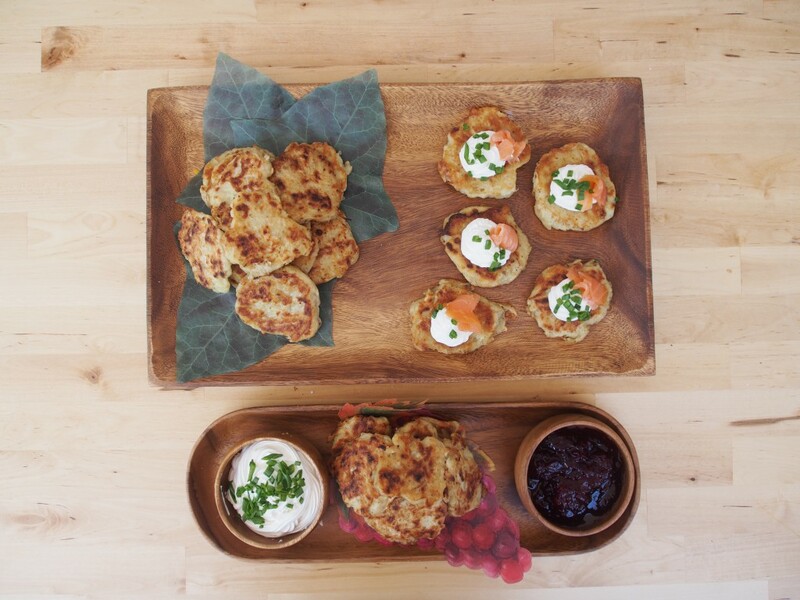 Now that you know how to make potato pancakes from scratch, something tells me you’re going to be doing it all year. It’s super-easy, after all, and incredibly delicious. But let’s just say you wanna try a different recipe. . . 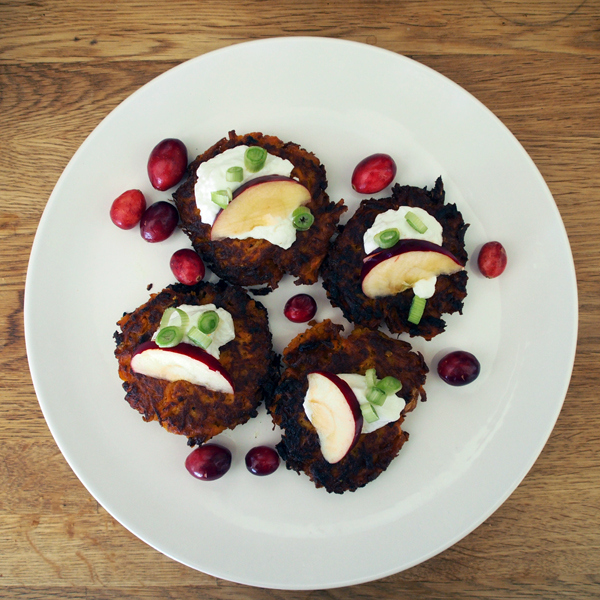 These sweet potato latkes are from our blog – we posted them last year when looking for a sweet potato recipe for Thanksgiving, which just happened to fall on the first night of Hanukkah. 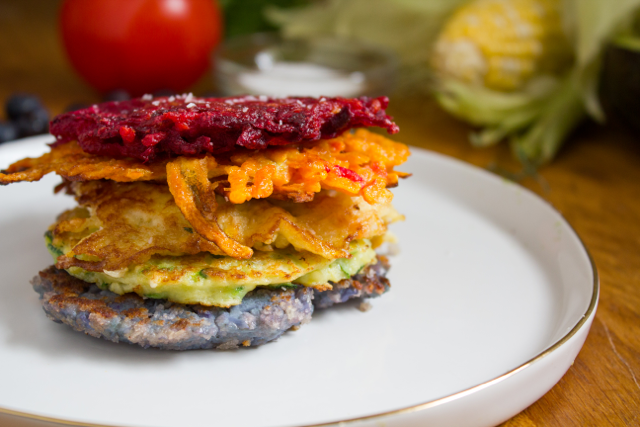 These rainbow latkes from What Jew Wanna Eat – Not only are they incredibly fun to look at, but they’re a great way to get an extra serving of veggies in. Each one is made from different produce, and is naturally colorful. 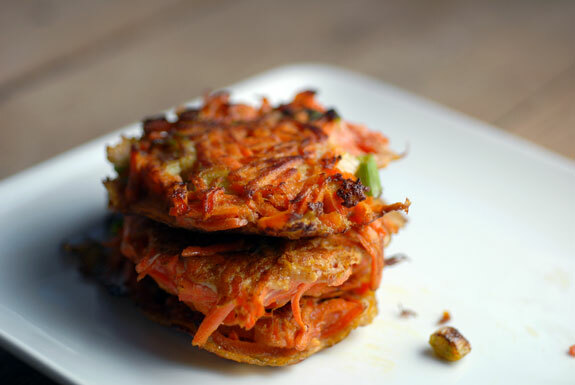 These Gluten Free Carrot Scallion Latkes from Elana’s Pantry. We love that Elana thought to make a paleo-friendly version of a latke, and we love the way the scallions and carrots taste together. A perfect combination! 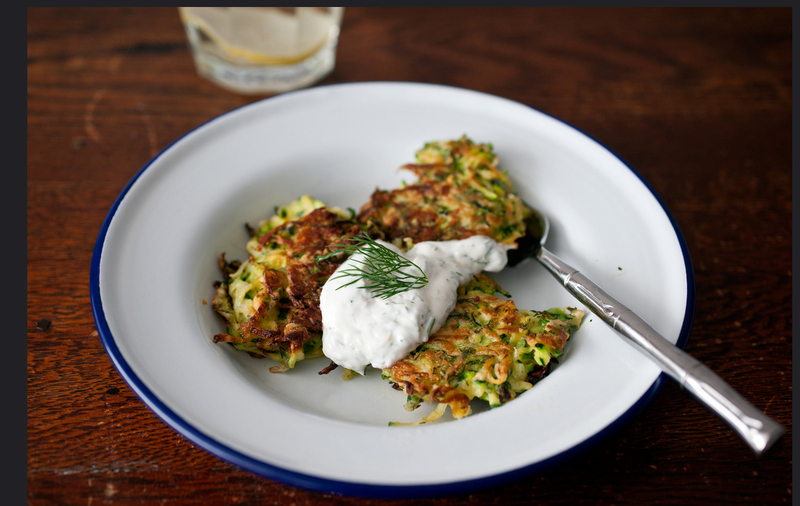 These super-flavorful Zucchini and Green Garlic Latkes from Sassy Radish – I’m a little obsessed with green garlic, and I always seem to have a surplus of zucchini, so to me, this is the perfect latke recipe. If you want to make it sweet, these Apple Latkes from Smitten Kitchen are AMAZING, especially with a scoop of vanilla ice cream. What a nice way to end a meal. Have a happy Hannukah, Friends. I hope you enjoy it!